Is your corn stand a keeper? But there are families who are having success in applying new communication and planning skills to help them with farm succession. It's a difficult conversation for many Iowa families, talking about transitioning the family business from the exiting generation to the entering generation. When those conversations haven't taken place, Iowa State University Extension specialists frequently hear concerns about the future from both generations. Chris Mondak, ISU Extension dairy specialist in northwest Iowa, was hearing it from her dairy families. She knew people at Iowa State had experience working with families transitioning the farm business, but Ames was a long way away for families with milking chores. Everyone involved needs to take part in the planning. In 2010, Mondak worked with local ISU Extension administration and county Extension councils to organize farm and business succession workshops and bring the Iowa State experts to northwest Iowa to conduct them. Specialists from the Beginning Farmer Center — John Baker, an attorney, and David Baker, a farm transition specialist — conduct the workshops. The basis of the local workshop comes from a four-day workshop held annually in Ames; with each successive satellite workshop they have tuned the content to meet the needs of the people attending. Farm families from the first five pilot workshops that have been held are pleased they attended and have come away with succession plans. "The boys were uneasy about talking. They all had different feelings about what was going on with the farm business," says Mark Schroeder of Remsen. "Having our sons and daughters-in-law attend the Extension workshop got us talking and some plans down on paper." Dean Schroeder, Mark's son, recommends the farm succession workshop to any farm family. Many families struggle with making succession plans. "Families say they don't know how to start talking about farm succession," says David Baker. "We ask them, 'What do you have now?' and 'Where do you want to go?' to get them started. We get them talking about the emotional side of the business and teach them how to talk to each other about difficult topics in constructive ways." "With the planning we started at the workshop, we will be able to keep the family farm operation together and grow it as the next generation comes onboard and we move forward," says Dean Schroeder, a workshop participant. John Baker says these aren't instinctive things, not conversations held in the machine shed or farrowing building, but planning is a skill that can be learned. "People come looking for skills and information to keep the farm in the family and to continue building the family legacy," he notes. "These workshops move university research into communities in ways Iowans want it, so they can make better decisions and live out their dreams and aspirations." 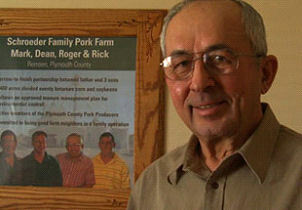 Dean Schroeder, Mark's son, recommends the farm succession workshop to any farm family. "Day to day we didn't think about planning, setting goals or talking about our wants and dreams, even though I knew my son wanted to be involved in the business," Dean says. "With the planning we started at the workshop, we will be able to keep the family farm operation together and grow it as the next generation comes onboard and we move forward." To learn more about farm succession workshops contact: The Beginning Farmer Center at bfc@iastate.edu or call 877-BFC-1999. Also, the you can view the Farm Succession Workshop from Iowa State University Extension on Vimeo.